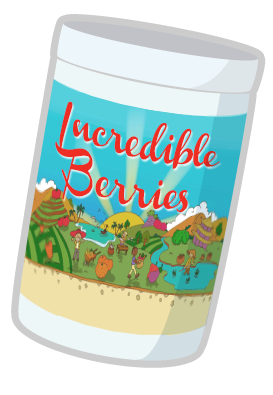 Incredible Berries Is Here! Save 50%. Incredible Berries is here. Get it for $20. Incredible Berries is stocked and ready to ship. Finally! 1). 40+ red foods, seeds, herbs, roots, and plant extracts. Incredible Berries is about 50% berries by weight, with the remaining half comprising of digestive fibers (flax, larch tree) greens (broccoli, kale, spinach), medicinal herbs (milk thistle, polygonum root, green tea leaves) and some whole foods derived metabolites and vitamins (lycopene, astaxanthin, lutein, choline). And more. It’s made according to the same principles as Incredible Greens, but is a completely different product. Of the 80 or so ingredients found in each, they only share two in common (acerola berry and soy lecithin). Compared to Incredible Greens, Incredible Berries is geared more towards blood sugar control, improved cognition, and respiration/circulatory support. Of course their health benefits overlap quite a bit, but you could conceivably get much better results with one than the other. 1). If you have a coupon that you use for Incredible Greens, this will work with Incredible Berries too. Some of you take advantage of coupons, giveaways, product review codes, and personalized discounts. If this includes you then these deals will also apply to Incredible Berries. 2). Many of you like to take advantage of our bulk discounts and buy 3, 6, or 12 at a time. If this is you then you can mix and match the two products and still get the same bulk offer. There’s complete parity between the two, so you can interchange the two however you see fit. 3). 30% More! A bottle of Incredible Greens is 263g. A bottle of Incredible Berries will contain 320g, or about 28% more by weight. It’s still going to last about the same amount of time if you take it once a day, but per ounce Incredible Berries is a better deal. All things considered Incredible Berries is going to have more ingredients that are more expensively sourced in greater quantities for the same price as Incredible Greens. Its product cost is almost twice as much, but there’s more to be gained by making something very convenient for a lot of people and skimming a little off the top than vice versa. If you want to try Incredible Berries you can get it for $20/bottle between now and the end of the weekend (September 16). No limits whatsoever. Use the coupon code “berries” at checkout and the discount will be automatically applied. For further reading on Incredible Berries, you can see the product page here. Here you can see the label, detailed description of all the ingredients. If you’d like to see a detailed comparison between Incredible Greens and Incredible Berries then take a look at the comparison page. congratulations! I love the greens so I will definitely get this over the weekend! I liked Incredible Greens but did not like the stevia that was added to it. Does this have stevia? It does have some stevia in it, but twice as less as IG. Most people like the sweet taste, but some did complain about it. Berries are naturally sweet, so there was less of a need to put it in there. Looks great. Will definitely try it, it has to taste good with all those berries inside it. I’ll probably buy it on Sunday, is there a particular time the coupon expires? You can use it all day Sunday. woohoo! after reading your email the other night I’ve been very excited for the berries! I think this is going to be great! Awesome! Been waiting for IB. Does it mix well with milk? The reason I ask is I used to add a different berry powder to my cereal and milk. Great way to spice up your Cheerios lol. And also, will sample packs or smaller sizes be available in the near future? I know a lot of people, myself included who like to try a couple servings of powder before buying the whole canister. I’ve mixed it with Milk, and it’s personally not my favorite way to drink it, but the powder itself blends well. I just don’t like mixing the two. This has been a little bit of a sticking point, since many people want to try it for a little bit before they get the whole thing, which I understand. I used my own personal savings to start making the supplements and have expanded it so far without outside investment, and at the moment would have a keener interest in using profits to develop new products at this point in time. That’s not set in stone, just what I think would be best. Question: if you were offered a 50% discount on the first order (with a full refund guarantee)….do you think this would act as a close substitute or would it be better just to get the packets? It depends on the product, but I would probably prefer smaller packets in most instances. Maybe 1/5 the servings for 1/4 the price, something like that. Whenever I’m at the health food store I buy pretty much all the trial sizes by the register, just to see what I like. Granted, I usually don’t end up by the full size product unless I really like it. So from a business perspective I’m not sure if that increases sales or eats into them (just being honest). No, you’re right. Small packets are inherently more cost/labor intensive, and require higher volumes than bottles, so going that way is a bit of a gamble. I haven’t focused too much on distribution (grocery stores, spa clubs, etc) but when that day comes packets will probably make more sense to go ahead with the packets.